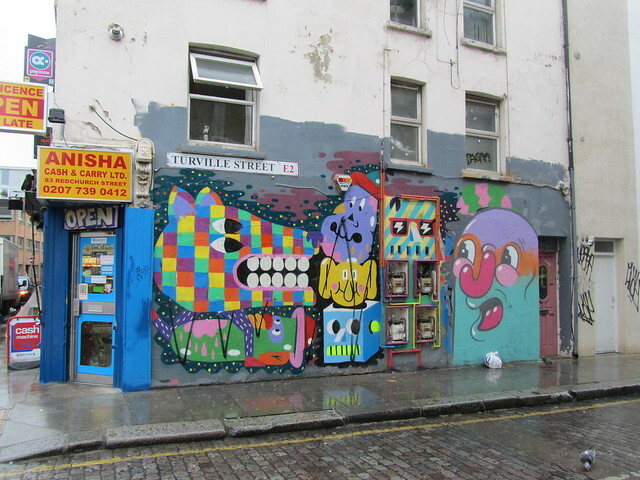 In March I went to an exhibition at Tony’s Gallery in Shoreditch and got two for the price of one. 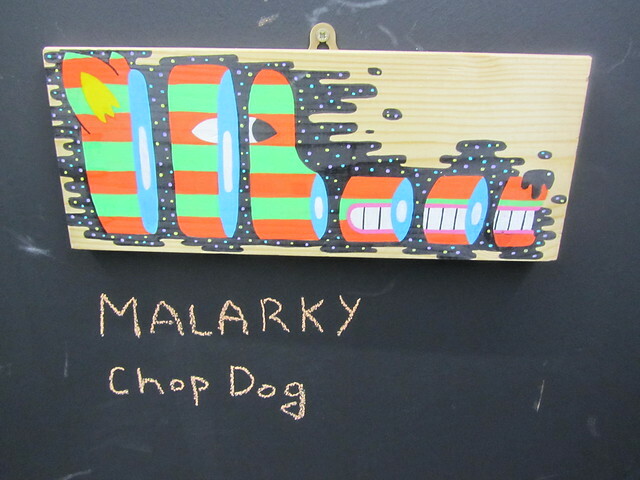 The artist I went to see was OLEK, but I didn’t realise the gallery also had an artist in residence: Malarky. 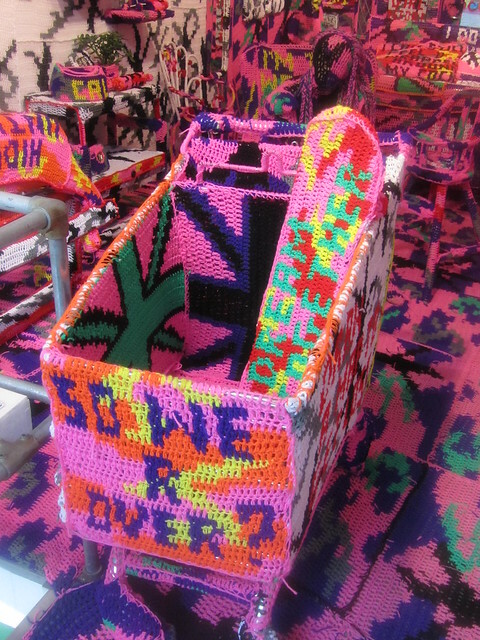 I’ll start with OLEK’s exhibition, “I do not expect to be a mother but I do expect to die alone”. 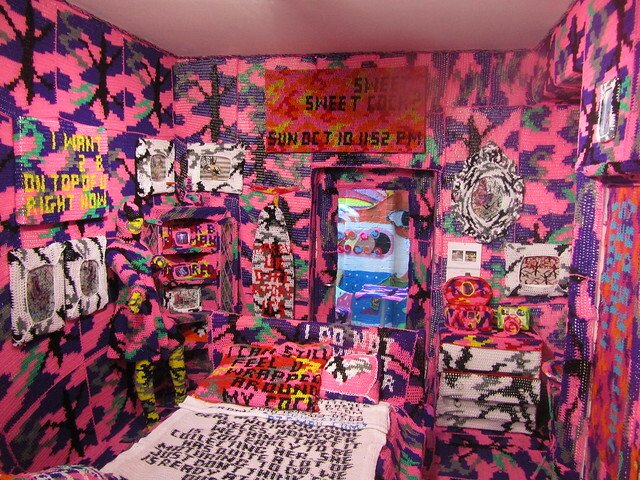 This was the first UK solo exhibition by Polish-born, New York-based artist OLEK. The exhibition or, rather, installation, was basically a knitted room. Everything as far as the eye could see was knitted, crocheted or wrapped in wool. Even the floor. It was unfortunate that it was raining heavily on the day I visited the gallery, but it was nice to take off my wet boots and walk about on the wooly carpet for a while. I’m not art expert, but I enjoyed the exhibition. It was fun, playful, and certainly unique. I particularly liked the people. 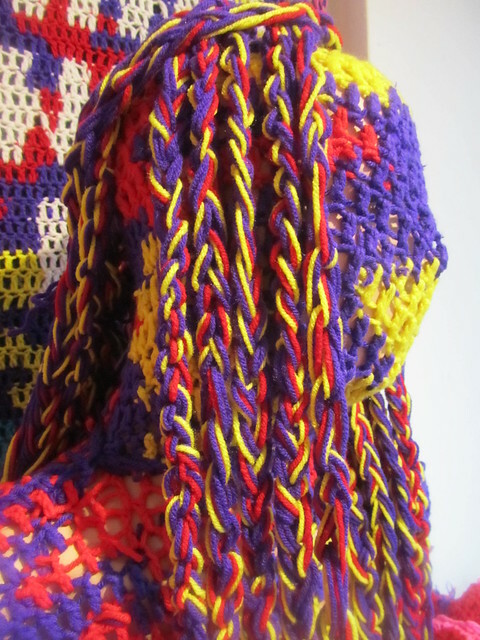 Both playful and rich in metaphor, the brightly coloured work on display features multiple designs including Olek’s trademark camouflage motif. 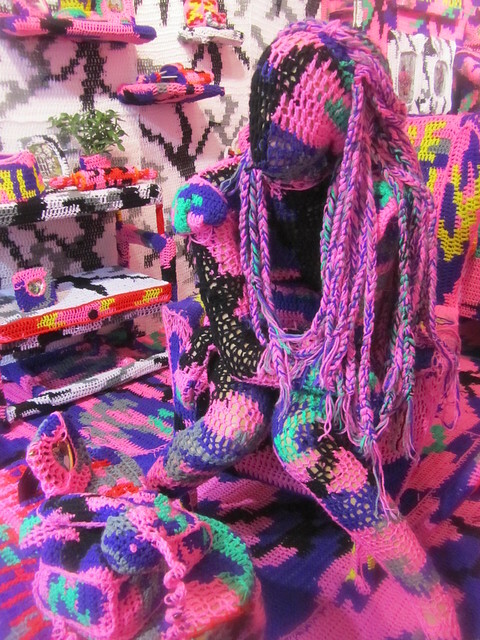 The omnipresence of explicit messages crocheted into the objects, are statements revealing her position as a female artist in an art world that is inclined to have sexist opinions. These text-based pieces replicate actual missives sent to the artist by SMS text messaging, immortalising intimate details of her past relationships. 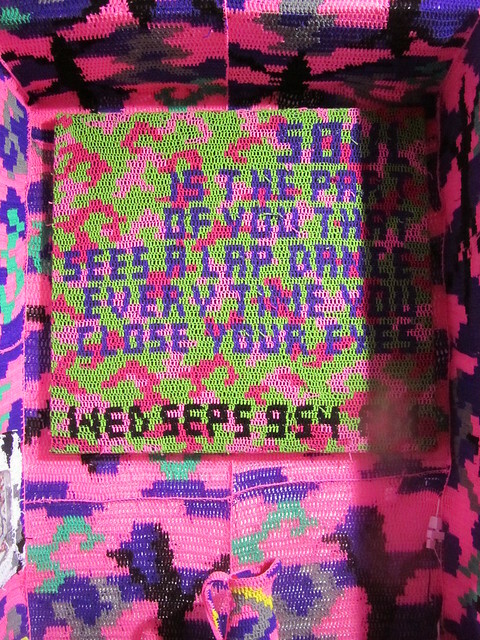 The viewer thus becomes witness to Olek’s personal history as she continues her exploration of modern day concerns, touching upon the themes of privacy, technology and communication. 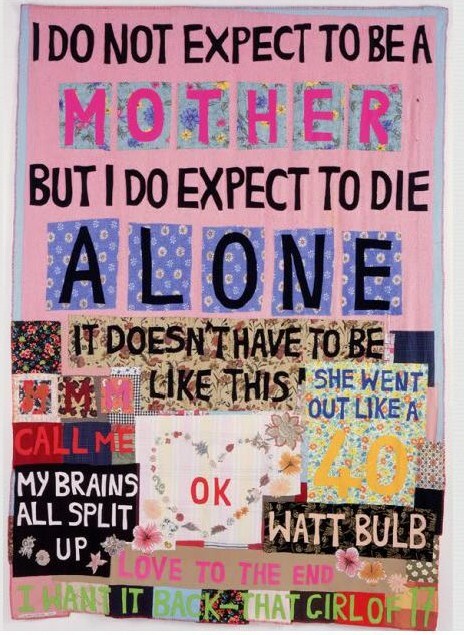 The show’s title is a direct quote from “I do not expect”, an appliquéd blanket produced by Tracey Emin in 2002. 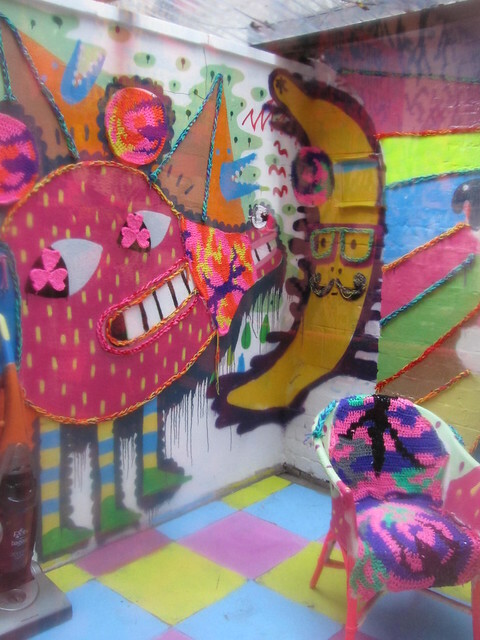 I have to say, I prefer OLEK’s work to Emin’s, although I can see that they do both fall into the same camp of “I wouldn’t really want that on my wall”. 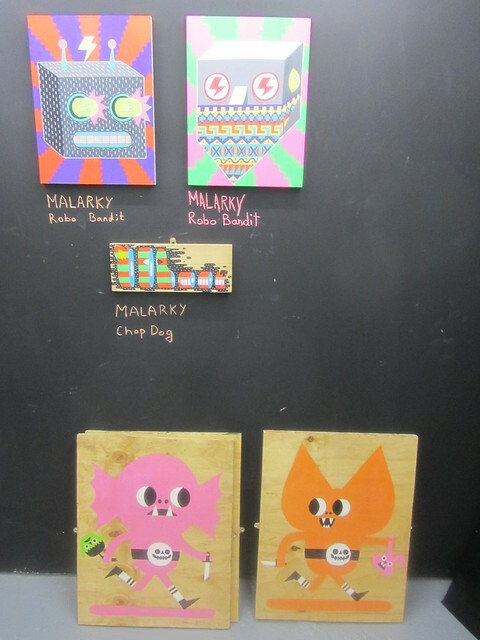 As I mentioned earlier, I was also able to see some of Malarky’s work at Tony’s Gallery. 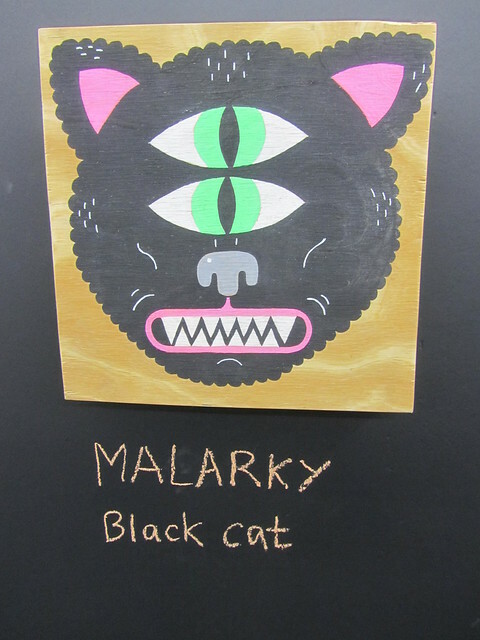 Actually, it’s never that hard to see Malarky’s work as he’s a street artist and his pieces are all over Shoreditch. 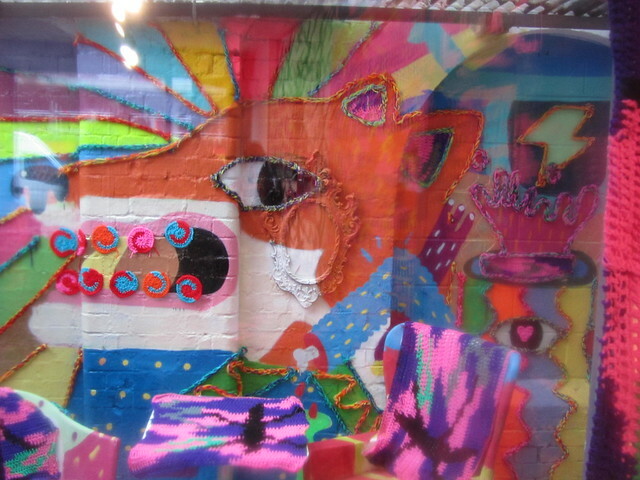 What I liked at Tony’s was the way that his work became incorporated with OLEK’s. There’s been a lot of fuss in the press this week over the new Damien Hirst exhibition at the Tate Modern. The media have been labelling his work “con-art” and saying that it s a case of “the emperor’s new clothes”. Art is so subjective – one man’s art is another man’s rubbish – so who’s to say what belongs in galleries? Is Hirst’s work any better or worse than Emin’s, or indeed OLEK’s? 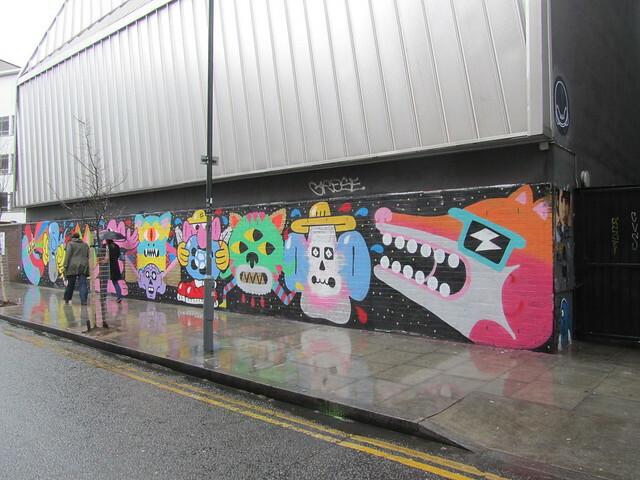 Does the fact the Malarky usually paints on walls make his work any less valuable than Hirst’s? What do you think? Wow! That is hectic but very interesting.